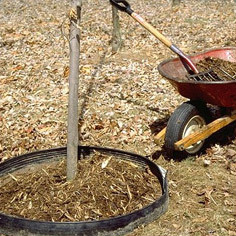 A properly applied layer of mulch is the single most beneficial thing you can do for a tree. Mulching conserves moisture, improves soil structure, reduces soil compaction, increasing aeration, makes more nutrients available, suppresses weeds, helps prevent weed whip and lawn mower damage--and creates a well-groomed appearance. Use good quality mulch. Composted wood chips or pine needles work well. Plastic should not be used because it interferes with the exchange of gases between soil and air, which inhibits root growth. Organic materials are best but pebbles and stone can also be used. Mulch should usually be 2-4 inches deep. Too much mulch can actually harm plants by inhibiting gas exchange. Placing mulch right up against the trunks of trees can lead to insect and disease problems. Ideally, mulch should be 6 inches away from the tree trunk and extend out to the dripline--the circumference around the ground of the tree containing the majority of the trees roots. Consider mulching at these times. Each spring before soil moisture drops and temperatures rise. Before, during and after construction in the immediate area of the tree and its roots. After a tree has been injured by weed whips, lawn mowers, drought, pruning, or other stressor. Arbor Garden can put a watering, mulching, and pest management strategy in place that is specific to your trees and shrubs.